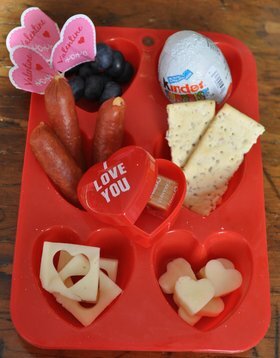 It’s muffin tin Monday again, and today’s theme was -Valentine’s Day! On the special menu today: some mozzarella (or pizza cheese as my kids call it) cut out as hearts. Next row, turkey pepperoni bites, and some crackes. In the heart container is a caramel square, one of Maddie’s all time favourite treats. Top row, blueberries on Valentine’s day tooth pics, and a Kinder egg, sent from Grandma as a Valentine day treat. All eagerly eaten! I hope you had a nice Valentine’s day lunch too. Check out lots of other ideas at Muffin Tin Mom. This is filled with such wonderful treats! I love the way you used the recessed part of the cheese. Very cute!